According to Apple, two new categories will appear “in the next few weeks”. The upcoming update is said to bring a new “Food & Drink” category, as the developers have just received an email from Apple about the upcoming change. The apps that help users cook and bake, mix drinks, manage recipes, find new restaurants and bars, and learn what their friends like to eat and drink will automatically be migrated to the new category. As for the current situation, while the App Store doesn’t provide a specific category for these types of apps, they are typically listed under Lifestyle by their developers. However, Food & Drink won’t include diet, grocery shopping, coupon clipping, or food-related game apps. In advance of a major redesign coming with iOS 6, by the end of May the App Store update introduced Editor’s Choice banners on the iOS and Mac App Stores that highlighted that week’s best apps. 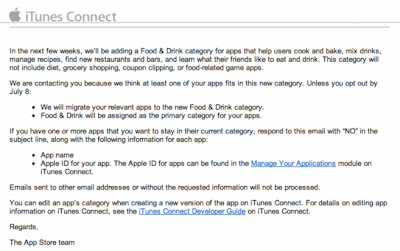 The Food & Drink is another change coming to the App Store, tweaked by Apple and revamped with new features recently. More lately the game bundles have appeared, with Apple attempting to group them into a macro category available from the App Store’s homepage. So as a logical result of thousands of apps being successful in using iOS devices as tools to manage recipes and find local restaurants, the separate dedicated Food & Drink category will soon be introduced. The thing to note is that iOS 6 will also feature Yelp check-ins in the new Maps applications with the improved emphasis on finding the new category of the App store. By now, what Apple offers is a custom Cooking section that helps to stage top-quality app selections for recipes, drinks, shopping, and reference material. Check the captured e-mail by Apple sent to the developers recently and do not hesitate to express your opinion about the App Store change that is said to come soon.